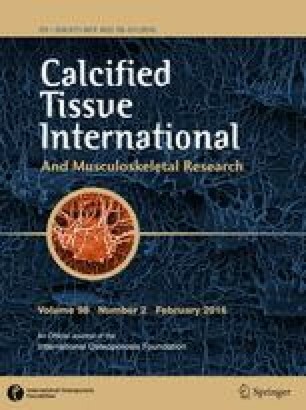 The orientation of nanoscale mineral platelets was quantitatively evaluated in relation to the shape of lacunae associated with partially embedded osteocytes (osteoblastic–osteocytes) on the surface of deproteinised trabecular bone of adult sheep. By scanning electron microscopy and image analysis, the mean orientation of mineral platelets at the osteoblastic–osteocyte lacuna (Ot.Lc) floor was found to be 19° ± 14° in the tibia and 20° ± 14° in the femur. Further, the mineral platelets showed a high degree of directional coherency: 37 ± 7 % in the tibia and 38 ± 9 % in the femur. The majority of Ot.Lc in the tibia (69.37 %) and the femur (74.77 %) exhibited a mean orientation of mineral platelets between 0° and 25°, with the largest fraction within a 15°–20° range, 17.12 and 19.8 % in the tibia and femur, respectively. Energy dispersive X-ray spectroscopy and Raman spectroscopy were used to characterise the features observed on the anorganic bone surface. The Ca/P (atomic %) ratio was 1.69 ± 0.1 within the Ot.Lc and 1.68 ± 0.1 externally. Raman spectra of NaOCl-treated bone showed peaks associated with carbonated apatite: ν1, ν2 and ν4 PO4 3−, and ν1 CO3 2−, while the collagen amide bands were greatly reduced in intensity compared to untreated bone. The apatite-to-collagen ratio increased considerably after deproteinisation; however, the mineral crystallinity and the carbonate-to-phosphate ratios were unaffected. The ~19°–20° orientation of mineral platelets in at the Ot.Lc floor may be attributable to a gradual rotation of osteoblasts in successive layers relative to the underlying surface, giving rise to the twisted plywood-like pattern of lamellar bone. The online version of this article (doi: 10.1007/s00223-015-0072-8) contains supplementary material, which is available to authorised users. This study was supported by the Swedish Research Council (Grant K2015-52X-09495-28-4), the BIOMATCELL VINN Excellence Center of Biomaterials and Cell Therapy, the Region Västra Götaland, an ALF/LUA Grant, the IngaBritt and Arne Lundberg Foundation, the Dr. Felix Neubergh Foundation, Promobilia, the Hjalmar Svensson Foundation, and the Materials Science Area of Advance at Chalmers and the Department of Biomaterials, University of Gothenburg. Furqan A. Shah, Ezio Zanghellini, Aleksandar Matic, Peter Thomsen, and Anders Palmquist declare that they have no conflict of interest.